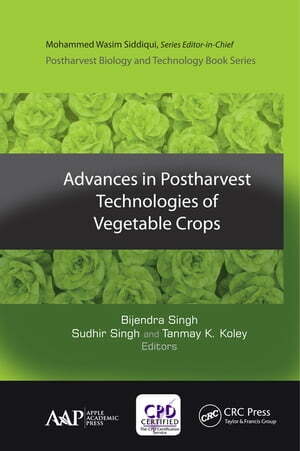 Collins Booksellers - Advances in Postharvest Technologies of Vegetable Crops by Bijendra Singh & Sudhir Singh, 9781351664141. Buy this book online. This book presents a selection of innovative postharvest management practices for vegetables. It covers technologies in harvesting, handling, and storage of vegetables, including strategies for low-temperature storage of vegetables, active and smart packaging of vegetables, edible coatings, application of nanotechnology in postharvest technology of vegetable crops, and more. It considers most of the important areas of vegetable processing while maintaining nutritional quality and addressing safety issues. Fruits and vegetables are important sources of nutrients such as vitamins, minerals, and bioactive compounds, which provide many health benefits. However, due to poor postharvest management—such as non-availability of cold chain management and low-cost processing facilities, large quantities of vegetables perish before they reach the consumer. Furthermore, higher temperatures in some regions also contribute to an increased level of postharvest losses. With chapters written by experts in the postharvest handling of vegetable, this volume addresses these challenges. It is devoted to presenting both new and innovative technologies as well as advancements in traditional technologies.